Fill the hole by pouring the sealer from a small dispensing container. A paper cup can crimped to create a pour spout and the liquid does not effect a paper cup. It may take a few applications to achieve filling because the sealer may penetrate down or sideways and the liquid level drops below the level of the surface. Use something (piece of wire, paper clip) to insert into the liquid and break any air bubble created. Then add more liquid until hole is full. Let the sealer cure for 3 hours or more between applications and it will take fewer applications to achieve buildup. Very cold temperatures (below 50 degrees F.) will slow down the sealer drying time. It may feel tacky for many hours. Wait until no longer tacky before next application. Build to slightly higher than the surface and do not be too concerned about overflow and the glossiness it creates around the hole. That will be corrected later in the process. Allow 24 hours (or more per above ) for curing, then use #0000 steel to polish down to the level of the surface. This may dull the gloss a bit, but that is ok and will be corrected with the final step. If the "0000" steel wool sanding has dulled the gloss and you want to recreate the gloss now that the hole is filled, you can seal the entire surface with more Porous Stone Sealer or, if the surface is low in absorption, with Aldon "S-B-S Sealer" . 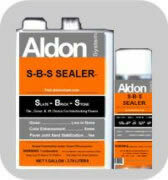 "S-B-S Sealer" is a lower solids content than "Porous Stone Sealer", but is otherwise the same formula. "S-B-S Sealer" will bond with the patched area and also seal the balance of the surfacing. "S-B-S Sealer also is available in spray cans that are ideal for this type application. See the page for your surface type at Surface Types to determine which sealer is most appropriate for you. (slates, marbles, limestones are usually best done with S-B-S Sealer). Fill the hole with a clear caulking that is rated as "paintable." The paintable designation is so that if a sealer is applied later, it will be able to adhere to the caulking. Apply caulking and wipe smooth immediately without pulling from the hole. Leave it a little higher than the surface for now. After it has cured (per caulking label), use #0000 steel to bring level to the surface. Sometimes lacquer thinner can be used on a rag to aid this finishing. After the caulking process is complete and cured, the surface can be sealed as described in Option "A" above.